The Ca.114s arrived in Peru in a glossy black and dark red scheme with thin ivory lines. Peruvian national markings were applied on the upper and lower wing surfaces and the fin and rudder. Insignia used by 2 EC included a top hat and cane painted on the port side of the fuselage ahead of the cockpit, as seen here, or a pair of dice in the same location. As border tensions between Peru and Ecuador increased during 1941, Escadrilles 42 and 43 of XXI Escuadron de Caza at Tumbes and Talara were allocated more Ca.114s, which were divided between the two units. This example, 43-5, wears the XXI EC pennant and took part in numerous missions over the border during the hostilities of July-October 1941. A CAPRONI FIGHTER. The Caproni 114 single-seater fighter fitted with a Bristol "Mercury" IV engine. It may be used for inverted flying and aerobatic training. The top speed is about 217 m.p.h. and the climb to 9,840 feet occupies 4 minutes. 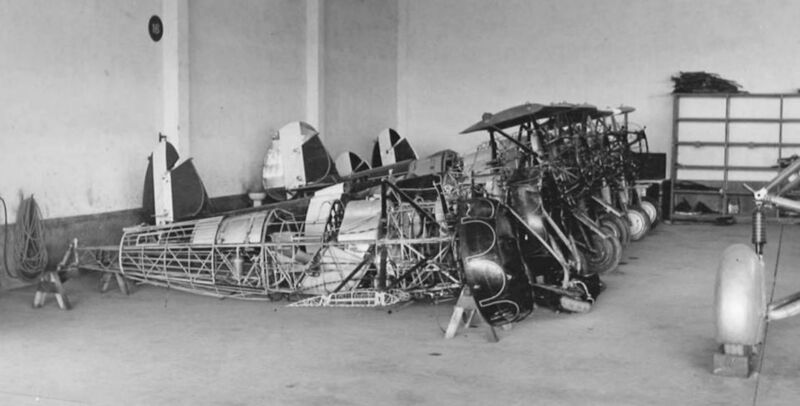 Caproni’s design to the specification for Italy’s next-generation fighter was a robust single-seat biplane with single-bay staggered wings of equal span, powered by a geared, supercharged Bristol Mercury radial engine, or a licence-built version thereof. The aircraft showed great promise but was rejected in favour of Fiat’s CR.32. 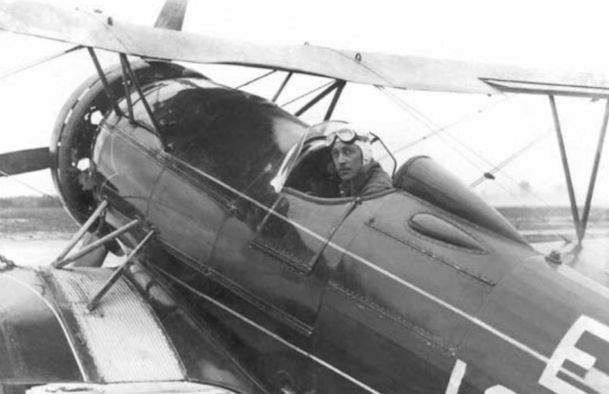 An unidentified instructor poses in the cockpit of one of the three Ca.114s initially operated by the Escuela de Aviacion Militar at Las Palmas. At the same time as the Italian Air Mission was invited to modernise Peru’s air force, Caproni was awarded a ten-year monopoly on the construction and repair of all military aircraft in Peru. Caproni technician Renato Torrezan, second from left, poses with his colleagues beside one of the recently overhauled Ca.114s at the FNA factory in May 1939. Without its distinctive undercarriage fairings, the Mercury-powered Ca.114 strongly resembles one of its closest British contemporaries, the Gloster Gauntlet. Officers of the Coronel Francisco Bolognesi training class pose with Regia Aeronautica pilot Tenente Luigi Bianchi (front row, centre), who was one of a number of Italians posted to Peru in 1935 to train Peruvian fighter pilots. Seen here operating with 28 Escuadron de Instruction in early 1943, 28-4-6 was lost on May 14 the same year, when its pilot was “expelled” after his safety harness failed during a manoeuvre. Six of the 12 Caproni Ca.114s of the Cuerpo Aviacion del Peru lined up outside the Fabrics National de Aviones (National Aircraft Factory - FNA) at Lima after overhaul in May 1939. Italian influence in Peru was strong after the Peruvian government had invited an Italian Air Mission to modernise the nation’s air arm in 1935. In the summer of 1939 the Ca.114s were sent to the FNA factory, run by Caproni Peruana - the Italian company’s Peruvian subsidiary - for an extensive programme of inspection and overhaul. Here the airframes are seen in the FNA hangar at Lima substantially dismantled. They would be repainted in an aluminium finish. 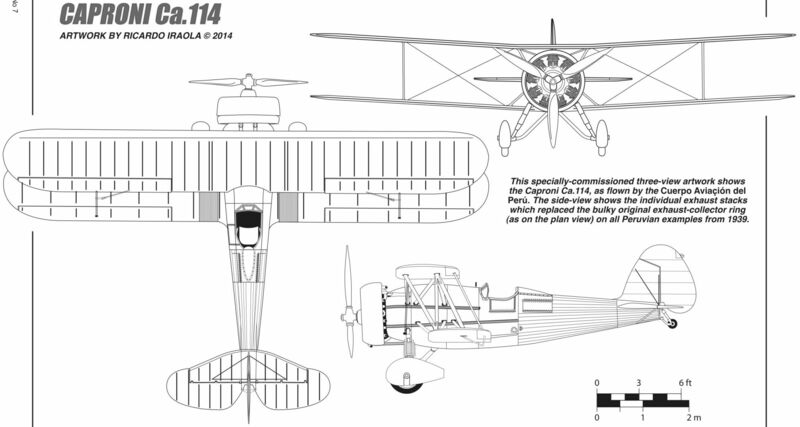 This specially-commissioned three-view artwork shows the Caproni Ca.114, as flown by the Cuerpo Aviacion del Peru. The side-view shows the individual exhaust stacks which replaced the bulky original exhaust-collector ring (as in the plan view) on all Peruvian examples from 1939.